When I flew over Borneo and saw the forest in flames, I knew my next book must be a sequel to Peace Tales. It won’t do us much good to learn how to live in peace, if we don’t have any air to breathe or water to drink. It was easy to find these tales. Most tribal groups tell cautionary stories designed to teach the importance of caring for their environment. Here are reader's theater scripts for "Too Much Sky" and "Reaching for the Moon" from Gail Johnson. I thought others might enjoy using them. 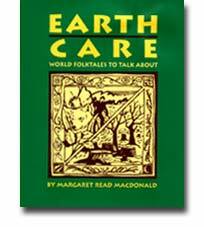 "These forty-one tales about environmental conservation represent an impressively broad array of world cultures." ...Horn Book, 1999. Bowker Best Books for Children 7th ed.